YOUR SWEET TOOTH WILL LOVE THIS LOW CARB CHEESECAKE DESSERT. 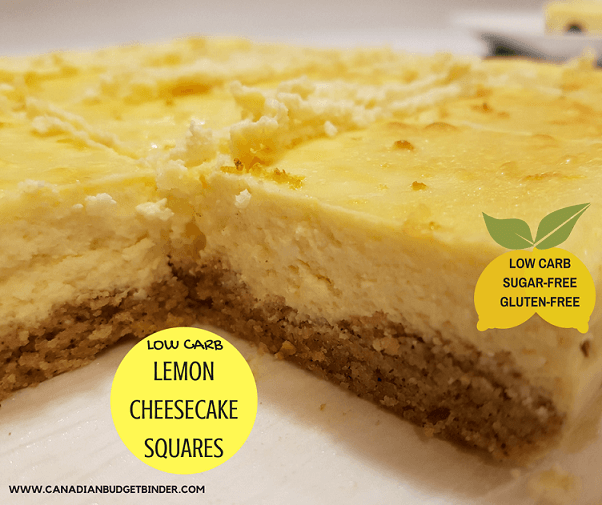 Lemon lovers this low carb lemon cheesecake is for you. While Spring cleaning our entire refrigerator we found 3 bricks of Philadelphia cream cheese that needed using up. Naturally, since we both have a sweet tooth Mrs. CBB and I went to work thinking about low carb desserts with cream cheese that we could create. Low carb cheesecake was our first thought, but what kind? Then we toggled back and forth ideas about unique cheesecake flavours that we could keep low carb. Tough times I know. Since we recently made a batch of low carb brownies (recipe to come) we decided to stay away from chocolate and go with a citrus cheesecake. Lemon cheesecake seemed like the obvious choice but could we make it taste like the real thing? Of course we could try. 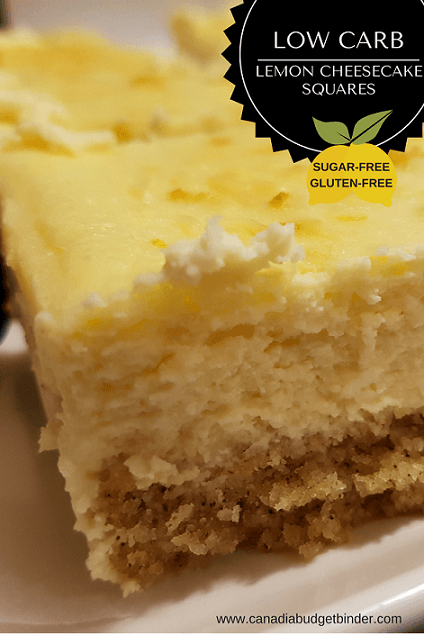 Since our low carb lemon pound cake with frosting was and still is our most popular low carb dessert we thought we’d make cheesecake with a tangy lemon twist. 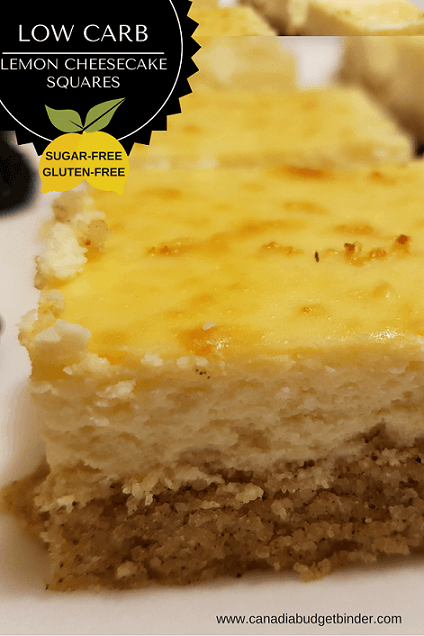 Creating a low carb cheesecake recipe wasn’t too hard since most of the ingredients in a classic cheesecake recipe are low carb. The sugar used in this recipe is powdered erythritol but you can use any approved sugar substitute. One concern we had was how to create the cheesecake crust which would either be nut based or nut based, ha! Not many options when it comes to sweet crusts when you eat a low carb diet. We decided on a homemade pre-baked almond crust but only on the bottom and not around the sides like we did with our (not low carb) cherry cheesecake. We did this to keep the carbohydrate count down even though an all around crust appeals to us. Nothing says cheesecake like a nice thick crust. Am I wrong? Typically the topping for cheesecake is a fruity sauce or a variety of sweet chocolate, caramel… and the list goes on and on. To stay on the low carb side of this easy cheesecake we went with whipped cream, lemon zest and a side of big juicy organic blackberries. 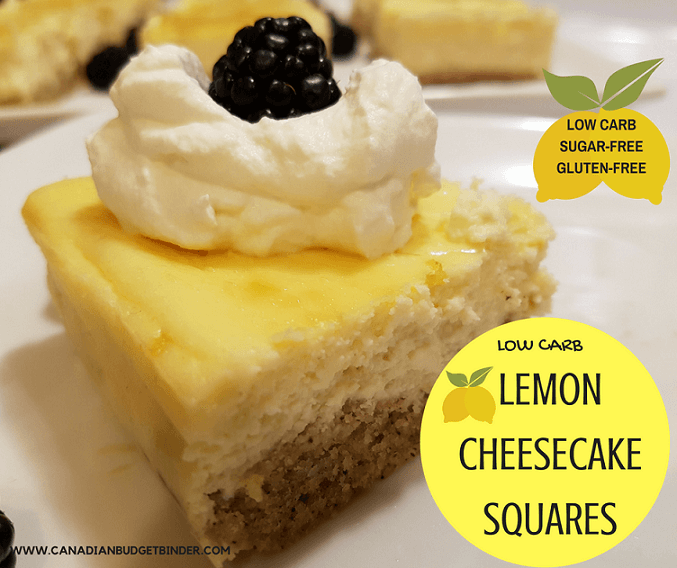 Serve these lemon cheesecake squares chilled at least for a couple of hours so they set nicely. You’ll find as the days go on if there are any squares left (optimistic I know) that they taste better. The sweet almond crust will start out like a crispy cookie but become moist but it will all melt in your mouth. 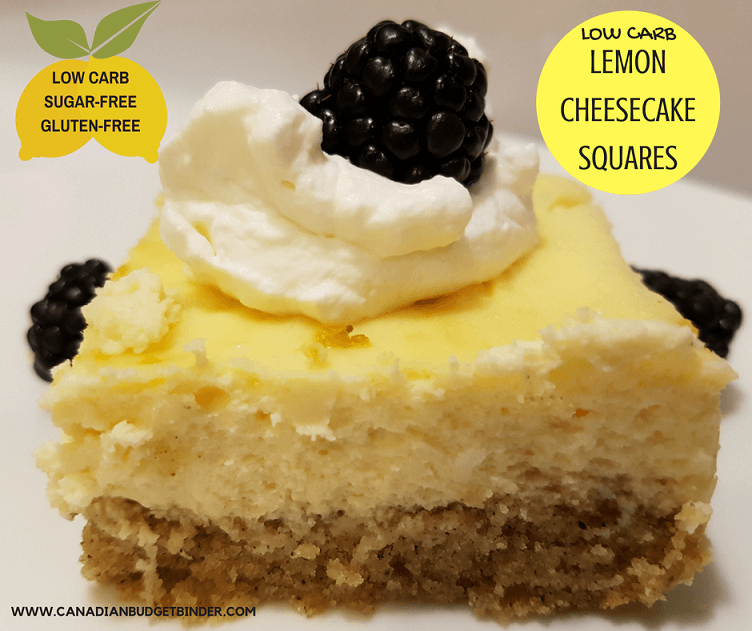 This lemon cheesecake simply is one of the best low carb desserts I’ve ever made next to our low carb lemon cream cheese pound cake. I also line the baking pan with parchment paper so the cheesecake is easy to remove. If you make this in a spring-form pan it also helps to remove the tray from the bottom if you line your bottom with parchment. The topping for this lemon cheesecake was fresh lemon zest sprinkled over the top right before baking. You’ll know when your cheesecake is ready to come out because it will look like a pillow just as the second photo above. 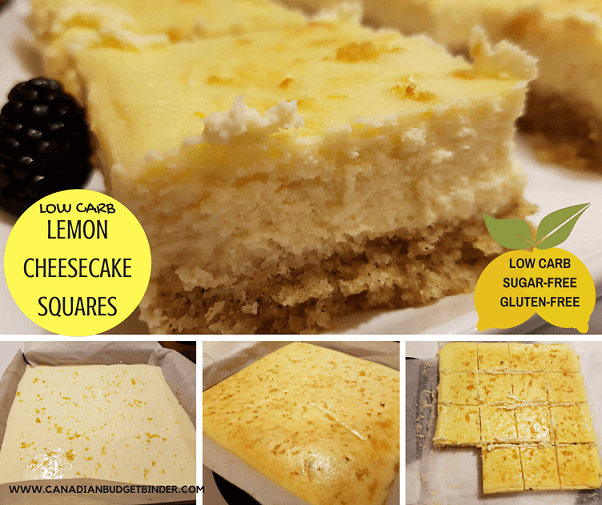 Remove your lemon cheesecake squares from the oven and let them cool then refrigerate for 2-3 hours. Use a clean knife every time you make a cut into the lemon cheesecake squares if you want nice cuts. The cheesecake filling is smooth and can catch on the knife. To finish them off I added some homemade sugar-free whipped cream and some organic blackberries. You can use blueberries, raspberries or strawberries as well. Any low carb fruit will do. We tend to stick with berries but these are only optional. ½ cup coconut oil (room temperature) you can microwave also as long as it is soft like butter. 3 drops of lemon oil - if you do not have lemon extract or lemon oil use more lemon juice. Taste the batter for citrus strength and add as needed. You can always add but you can't take away. Line a 9x11 baking pan with parchment paper with hangovers. In a bowl add all of the crust ingredients and mix until it comes together like a cookie dough. This is essentially an almond shortbread crust. In a stand mixer add your softened cream cheese, eggs, vanilla, lemon extract, lemon oil and fresh lemon juice - or from a bottle. Mix until combined. Make sure there are no lumps. If you find any mix with the whisk element. Pour over the hot almond shortbread base that has just come from the oven. Spread evenly and then top with lemon rind. In a large roasting pan fill the bottom with about an inch of water. Sit the cheesecake pan into the water bath. Watch over the pan to make sure all of the water doesn't evaporate. Add more as needed to prevent burning. Bake at 325 for 50 minutes or until the top looks golden. Remove from oven, let cool and refrigerate for 2-3 hours before cutting and serving. Honestly, if you go without the whipped cream and the berries you have one heck of a lemony cheesecake square. I love the taste of lemon so for this recipe I added real lemon juice, lemon oil and lemon extract. Talk about citrus delight. You’ll love it though. Per 1/24 Recipe: 170 Calories , 6 g Carbs, 3 g Fibre *Using Atkins Carb Counter /Net Carbs 3g per square. This will change depending on the size you cut them. Where do you guys buy erythritol? You can buy it at the Bulk Barn. If you have a coffee grinder it goes a long way once you powder it. This recipe is really confusing… I can’t figure out which ingredients are for the crust, and you have cream cheese listed twice. Oh you’re welcome Naomi. It’s always nice to have fans watching over what I do. Teamwork. Good luck and let me know how it goes. These really are very simple to make. Enjoy.